Are you stressed out during finals? Doing some simple yoga poses during finals is a healthy and useful way to de-stress. These yoga poses only take about 3 minutes and 30 seconds to do, so you can fit them into your busy,busy day. One yoga pose you can do is a variation on Tadasana (Mountain Pose); this pose helps you improve your concentration levels by increasing your focus level. All you have to do is put your hands above your head and make both palms touch. Keep your feet flat on the mat or the ground but slightly spaced out with your big toes touching. Take deep breaths, in through your nose and out through your mouth, and hold the position for a minimum of 30 seconds while breathing normally. 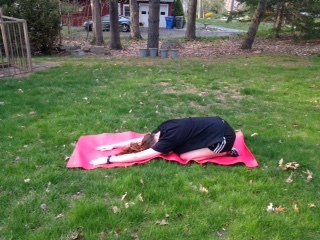 Another yoga pose is Balasana (Child’s Pose); this pose helps you relax completely, like a child. Sit on your knees with your palms facing the floor on either side of your body. As you inhale, bring your whole body forward so that only the forehead touches the floor. Stay in this position for a minimum of 30 seconds while breathing normally. Another pose that you can do is Padmasana (Lotus Pose); it helps to increase self-awareness levels. It helps you calm down and soothes your stressed mind. Sit cross legged: the left feet should be on the right thigh and vice versa while the soles of your feet face up. Keep a straight back and breath slowly. Maintain this pose for a minimum of 30 seconds. Keep in mind that if you have bad knees then this pose may not be for you. Another pose you can use is Adho Mukha Svanasana (Downward Facing Dog Pose); this pose relaxes your body and relieves stress. Stand straight with your feet flat on the mat. Keep your spine straight while your feet are placed flat on the matt, your palms facing your thighs. Breathe normally and bend forward. Then, place your hands on the mat and walk outwards with your hands. 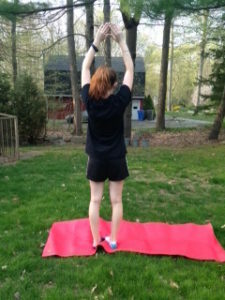 Next, slowly stretch your legs so they are in line with your arms fully extended. Inhale deeply and tuck in your stomach completely, hold this position for the minimum of 30 seconds. The last pose and my favorite pose is called Savasana (Corpse Pose); this is a really simple pose including normal breathing levels, no yoga asanas, and it helps soothe down stress levels. Lay down with your arms out flat, slump your body in such a way where you look lifeless, and let everything go. This pose also helps you do away with fatigue and fills your mind with an intense sense of calmness. Doing regular yoga helps reduce stress in a wonderful way and calms down your mind. It also keeps you in shape. I’ve been doing these poses during my finals week for the past two semesters, and it’s calmed me down so much. I keep a clear head and that helped me focus on finals which helps me do better.